Claes Oldenburg was born on January 28, 1929 in Stockholm. He was the son of a Swedish diplomat that was station in New York. He grew up in Chicago. Went to Yale University to study literature and art history. He later moved to New York and met other artists, which inspired him for the idea of soft sculpture in 1957. He designed a free-hanging piece made from women’s stocking that is stuffed with newspaper. In 1959 Oldenburg started to make figures, signs, objects out of paper mache, sacking, and other rough material. Oldenburg’s first show that included 3-dimensional work in May 1959 was at the Judson Gallery. Which was at the Judson Memorial Church on Washington Square. During the 1960s Oldenburg became associated with the Pop Art movement and created so many performance art that were related productions of that time. The name that Oldenburg gave to his own productions was called “Ray Gun Theater”. The first wife that was with Oldenburg from 1960 – 1970 was Pat Muschinski. She sewed many of his early soft sculptures that seemed to be a constant performer in his happenings. Later in 1965, Oldenburg turned his attention to drawings and projects for imaginary outdoor monuments. These monuments later took the form as collages that are in a variety of places. 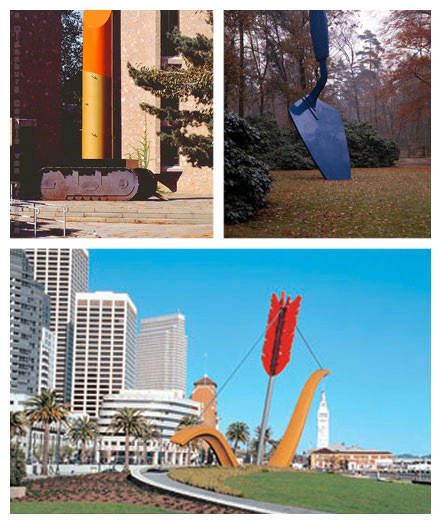 Oldenburg mostly concentrated on public commissions from the early 1970s. He later collaborated with Dutch/American writer and art historian Coosje van Bruggen in 1976. Their first collaboration was the rework of Trowel 1: a sculpture made in 1971 of an oversize garden tool for the ground works of the Kroller-Muller Museum in Otterlo, Netherlands. They also made the design of the Cupid’s Span down at the ferry near the Bay Bridge in 2002. Oldenburg and Coosje van Bruggen designed many designs for many places that are around certain places in the states. Oldenburg’s first one Claes Oldenburg-man show at Judson Gallery in New York, included figurative drawings and paper-mache sculptures. In December 1961, he rented a store on Manhattan’s Lower East Side to house “The Store”, which is stocked with sculptures roughly in form of consumer goods. An architecture student named Stuart Wrede and a group of architecture students collaborated with Claes Oldenburg while raising money to make the Lipstick. To this day, Oldenburg continues to contribute to the art industry.